On June 29, 2013, Ted Christopher was involved in a truly bizarre incident during a NASCAR Whelen Modified Tour event at Riverhead (N.Y.). 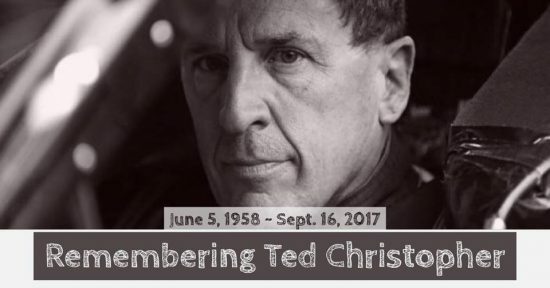 Below is the story that was published at RaceDayCT.com, with the description from the man himself. In the realm of NASCAR racing, most who have spent any extended length of time around the sport can rattle off the dialogue of scenes from the movie Days of Thunder in the way most people can remember the words to Jingle Bells. “Hit the pace car?” Trickle says. “Hit the pace car,” Hogge responds. Ted Christopher wasn’t thinking he had anything much close to a perfect night Saturday in the Whelen Modified Tour Hoosier Tire 200 at Riverhead Raceway, but at the end of the night, the former series champion was able to make light of the unusual way his race ended at the track. Christopher was leading the race coming to the green flag for a lap 194 restart when he spun his tires and got hit from behind and was sent spinning to the infield. Christopher’s slide through the infield ended when he his No. 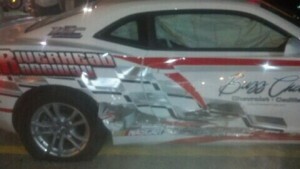 3 Modified rammed into the side of the Riverhead Raceway pace car. “The thing got spun off and [third place running Eric Goodale], I don’t think he’s lifted yet,” Christopher said. “He drove through me. It’s not his fault or whatever, yes or no. But it spins me and then sure enough I go spinning. I thought I hit the inside pole or tires or something like that. I looked over and saw the lettering and I thought ‘I [freaking] hit the pace car.’ What are you going to do? The hit from Christopher’s car caved in the side of the Chevy Camaro pace car, setting off the car’s safety airbags. Nobody was hurt.